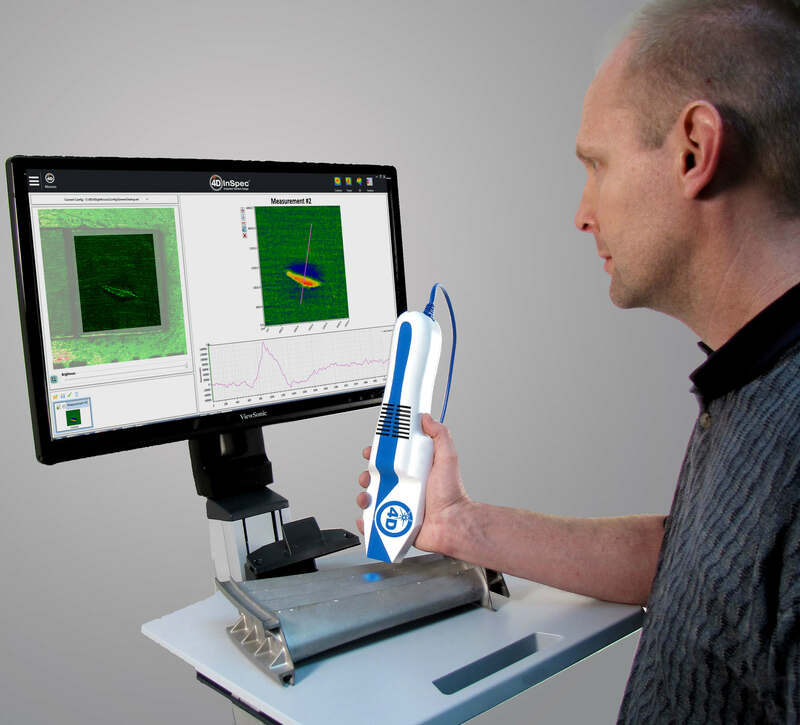 4D Technology today announced the 4D InSpec® Surface Gauge, the first handheld, non-contact instrument that measures precision machined surface defects and features with micrometer-level resolution. The 4D InSpec will debut at the International Manufacturing Technology Symposium (IMTS) 2016 in Chicago, IL, September 12-17, in the 4D Technology Booth E-5852. The 4D InSpec employs 4D’s patented technology which enables rapid measurements that are unaffected by vibration present in most manufacturing environments. For the first time, QA/QC personnel using the 4D InSpec can take repeatable precision surface measurements in factory floor, machine shop and field service environments. The 4D InSpec brings micrometer resolution surface measurement to the factory floor. Inspectors can directly measure components of all sizes with unmatched ease-of-use, speed and repeatability. Courtesy of StandardAero. Precision machined surfaces on turbine blades, drive train components and other critical parts may incur damage during production and may wear and corrode from use and/or environmental exposure. These surface defects can cause system failures with significant financial consequences and even catastrophic, loss-of-life events. Until now, QA/QC personnel have relied on visual comparison techniques to determine the severity of surface defects. These methods, however, are not precise or repeatable, which can result in missed defects and, more frequently, costly rejection of parts that actually meet specifications. Nanoscale surface metrology systems can provide more reliable data, but these systems are too expensive, slow and susceptible to environmental factors for use on the shop floor. Such instruments are also typically mounted in workstations that limit their capability to measure large components or to image defects in tight corners. Inspectors must create plastic/rubber replicas of these surfaces, which can then be measured—a costly and time-consuming operation. The 4D InSpec fundamentally changes how precision surface measurement is accomplished by enabling direct inspection of large and small components, right on the shop floor. Rugged and lightweight, the handheld gauge has a single cable tether to its computer and is designed to handle the rigors of daily use. The system measures surface defects between 0.1 and 100 mils (2.5 to 2500 micrometers) deep on a wide variety of part geometries. Its unique design makes it easy to access tight corners or reach across large surfaces. A “fold mirror” attachment enables borescope-like access to features without direct line of sight. “The 4D InSpec is an innovative measurement system that the aerospace industry has needed for years—beyond years,” said Sean MacKendrick, Production Engineering Manager at StandardAero, one of the aerospace industry’s largest independent maintenance, repair and overhaul (MRO) providers. The 4D InSpec installs in minutes and features an intuitive, touchscreen interface for setup, operation, analysis and report generation. Its easy-to-use software automatically finds critical features and calculates height, volume, area, slopes and location. Operators can quickly select 2D traces or 3D plots to view feature details. The system also supports network or USB data transfer to QC systems for rapid pass-fail analysis and historical data tracking. A complete 4D InSpec system includes the handheld gauge, computer, touchscreen display and software. The gauge can also be mounted in a microscope stand configuration or on a robotic manipulator for highly-repeatable QA/QC, or for automated measurements of complex components. An optional, mobile workstation with rechargeable, 8-hour battery and integrated touchscreen is available. 4D personnel will conduct detailed demos of the 4D InSpec at IMTS in Booth E-5852. Attendees are encouraged to bring samples to the booth to see firsthand how the 4D InSpec can change the nature of QA/QC inspection.